Flicker user craigiest has some nice shots of the city from Mt. Diablo. I took the liberty of merging them into a panorama (which is of course completely illegible thanks to the WordPress 450 pixel width limit. Do click to enlarge — especially nice if you have an 8000 pixel wide monitor). I use the angle between the Transamerica Pyramid and the Bank of America building to get perspective when I’m looking at SF from a weird position. Still, I was getting seriously confused trying to figure out what I was looking at here. This view encompasses the Mission. 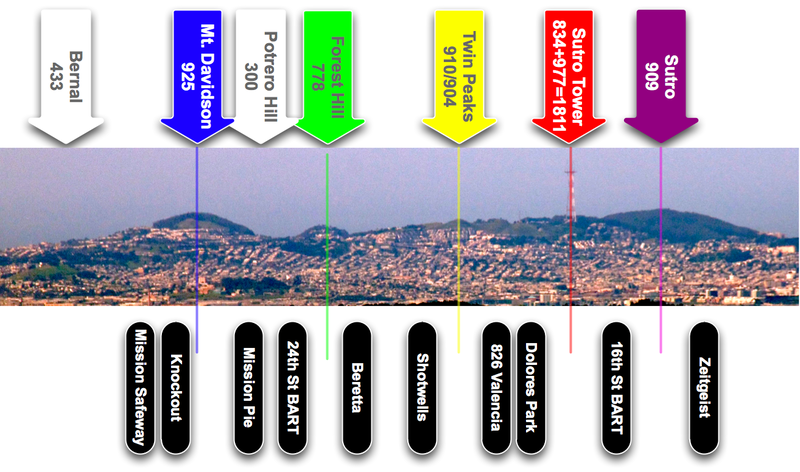 But where is my favorite hill, Bernal Heights? Using the power of line/arrow color coordination, we can tell that Bernal is the green patch to the left of Mt. Davidson, which is certainly not what I was expecting. The angles get really weird, but just remember that Mt. Diablo is east by northeast rather than the straight shot east as I tend to think (which is the excuse I am using if any of this is wrong). JohnnyO, you are a loon. You are also my kind of loon: mildly obsessive and utterly genius.